Our goal is to make high-quality dentistry affordable and convenient. We accept most insurances and offer early AM and evening appointments. Most importantly, you will always be greeted with a smile. Dental Checkups & Cleanings Six-month hygiene visits are crucial for maintaining a healthy smile. Children's Dentistry Gentle & compassionate, Dr. Shah loves working with children. Sedation Dentistry Eliminate fear & anxiety with nitrous, oral sedatives, & even IV sedation. Six Month Smiles® Straighten teeth in 6 months with nearly invisible wires & brackets. Porcelain Crowns Restore function & aesthetics with durable porcelain restorations. on life with the smile of your dreams. Finding a good dentist is a lot like searching for a new best friend when you’re older. By the time we are in the adult years, we’re mostly set in our ways – and, social-circle newcomers are few and far between. Stumbling upon the best dentist in Arlington that fits perfectly into your life can be a challenge, but it isn’t impossible. Rest easy and take a deep sigh of relief – your search ends here. 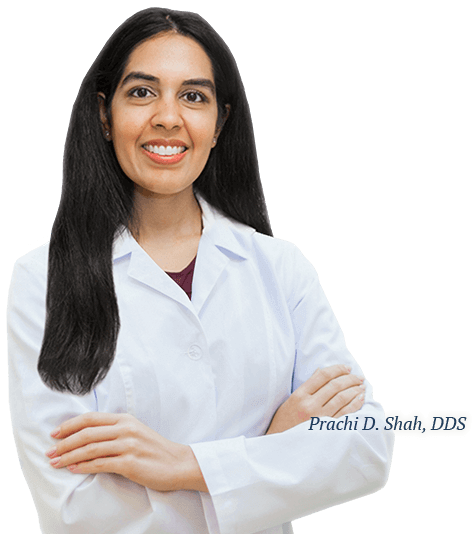 You’ve found Dr. Prachi Shah. Dr. Shah’s comprehensive selection of services, gentle, caring touch and energetic, yet calming, personality is sure to keep you and your family smiling for years to come. As a member of the American Academy of Children's Dentistry, Dr. Shah welcomes children of all ages to our Arlington, Texas dental practice. Kids and parents alike love the fun atmosphere we’ve created and appreciate our team’s compassionate approach to dentistry. At South Arlington Dental Care, we take pride in offering little ones all across Tarrant County dentistry that is comprehensive and gentle, but also informative. Dr. Shah’s ultimate goal is to help instill a positive outlook on oral hygiene and reinforce good habits by creating educational and positive experiences. Dental anxiety affects 30% of U.S. adults and 50% of our children. It isn’t a mystery why – adults typically had a poor childhood experience at the dentist or are just anxious in general at doctor offices – and, children fear the unknown and dislike the sights, smells and sounds. At South Arlington Dental Care, we work hard to make fear and anxiety nonexistent. Our office is designed with your comfort in mind, and we bend over backwards to ensure every patient – big and small – has a positive experience. And, for those especially anxious – we offer several sedation dentistry options from nitrous oxide to oral conscious sedation to advanced I.V. sedation.